Projector, 3-in-1 AV cable, User Manual, remote Control, Warranty Card. Native Resolution: 1920x1080, Number of Lamps : 1, Internal Storage : 1GB RAM, 8GB ROM, Minimum Projection Distance : 1-5Meter, Memory Cards Supported : No, Usage : SD Card, Computer, Laptop, Mobile, PlayStation, VGA, HDMI, USB, AV, Dual USB, HD Graphic Mode : No, Graphic Mode : No, Adjustable Aspect Ratio : 16:9 and 4:3, Standard Brightness : 3000, Maximum Diagonal Projection Size : 30-170Inches, Contrast Ratio : 6000:01, Language Supported: English, Power Supply: AC 100-240V 50 / 60Hz, Power Consumption - Standby Mode: 170W, Video File Format Supported: MP4, Text File Format Supported: Yes, Remote Control: Yes, Audio Type: MP3, Output Per Speaker: Yes, Number Of Speakers: Two, Other Audio Features: Yes, Other Power Features: No, Other Lens Features: No, Other Connectors: Yes, Audio Out Connectivity: Yes, Controls: Remote, Security Slot: No, Mounting: Yes, Keystone Adjustment: Yes, Audio File Format Supported: Yes, Photo File Format Supported: Yes, Audio In Connectivity: No, USB Connectivity: Yes, Headphone Jack Connectivity: Yes, PERFECT FOR HOME CINEMA- It is ideal for home entertainment, such as videos, photos, games. If you connect the HDMI with the laptop, it can be used for data presentations, like PowerPoint, PDF, Excel. Built-in stereo speaker, EXCELLENT IMAGE QUALITY: The projector is 3840 X 2160 resolution, it can support 1080P video. 5700 lumens with 6000:1 contrast ratio, can maximize the use of LED luminous efficiency. It could produce clearer and more colorful vivid image, make you see the true-to-life image. Enjoy HD movies just stay at home. 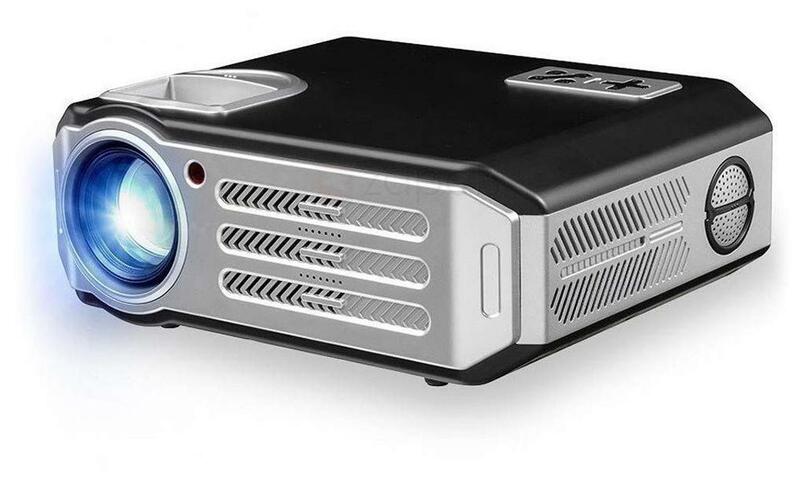 BOSS S11 PROJECTOR- This is a lightweight and small-sized projector, good for portability. With this projector, you can watch your favourite movies and any visual content anywhere you want.